Located 49 kilometres from Merredin, Narembeen and Bruce Rock the small railway siding town of Muntadgin celebrated its 75th anniversary in 2005. 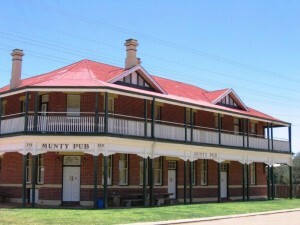 The delightful fully restored Munty Pub is the main feature of the town and the hub of the social life of the community. A pleasant place for a stay in the heart of the Wheatbelt. The town boasts tennis courts and golf course and walks on the nearby granite rock. Public toilets available at the Tennis courts. A classic 87 year old hotel that is the heart of the small community around the Muntadgin siding located some 49 kilometres south east of Merredin. The hotel has been beautifully restored with pressed tin ceiling, polished boards and renovated rooms. Six upstairs rooms with shared facilities are available. Caravan and camping sites available. Home cooked meals and take away – pizza, fish and chips etc. Tea room serving light lunches, tea, coffee, high tea and cakes. Rock walk nearby.